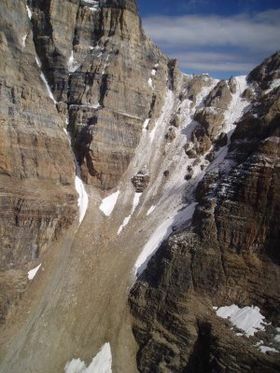 Abbot Pass lies between Mount Lefroy and Mount Victoria, in the divide between the valleys of Lake O'Hara and Lake Louise. It was named for Philip Stanley Abbot who died in 1896 in an attempt to climb Mount Lefroy with Charles Fay, Charles Thompson, and George T. Little. Abbot Pass has a stone hut, built in 1922 by Swiss guides working for the Canadian Pacific Railway, now maintained by the Alpine Club of Canada. ^ "Abbot Pass". BC Geographical Names. This Alberta's Rockies location article is a stub. You can help Wikipedia by expanding it. This page was last edited on 11 January 2017, at 09:48 (UTC).